Statisticians say China's one-child family planning policy has helped to control population growth. Beijing (CNN) -- China's population today is larger, more urban, aging and more mobile than ever before. The population of the second largest economy in the world shot up by 73 million people over the past decade, up 5.7 percent to 1.339 billion in November 2010 from 1.27 billion in 2000, according to new statistics released Thursday by China's Bureau of National Statistics. At of the end of 2010, population was expected to be 1.34 billion. While China grew by approximately the current population of Turkey, its overall rate of increase was slower than the preceding decade. This could affect China's economy as the number of future workers is likely to contract. The census also revealed that China's population is also aging, better educated and made up of more migrants than ever, the head of the National Bureau of Statistics Ma Jiantang said in a news conference. The proportion of mainland Chinese people aged 14 or younger was 16.6%, down by 6.29 percentage points from the last census, a decade earlier. "The data from this census show that our country faces some tensions and challenges regarding population, the economy and social development," said Ma. "First, the aging trend is accelerating, and second, the size of the mobile population is constantly expanding." China's migrant population is up 81.03 percent since 2000. "The rapid shift of rural labor force to non-agricultural activities and fast economic development contributed to the growing size of population migration," Ma said in a statement. The urban population shot up by 13.46 percent over the past decade, which means nearly half of Chinese people live in urban areas, the census stated. China's one-child policy shrunk the average size of a family to 3.1 people from 3.4 people. For national statistician Ma, this demonstrates China's one-child family planning policy has been relatively effective in bringing down population growth. The overall population growth rate was down 0.57 percent on an annual basis. "These figures have shown the trend of excessively rapid growth of China's population has been under effective control," Ma told reporters. Gender numbers were a surprise, after more than a year of speculation that single Chinese men would eclipse single Chinese women in the near future. Contrary to expectations, males accounted for 51.27 percent of China's population, while females made up 48.73 percent. There was good news in education. Literacy is up by nearly 3 percentage points in China. As of 2010, 4.08 percent of Chinese are illiterate, down from 6.72 percent in the 2000 census. The frequency of a university education more than doubled over the past decade. For every 100,000 Chinese people, 8,930 have university educations as opposed to just 3,611 in 2000. 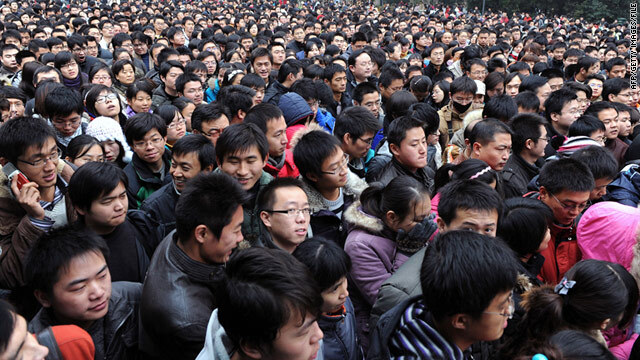 China deployed over 100,000 census takers in Beijing alone for the 2010 Census, its biggest ever. Over 6 million people were involved in visiting 400 million households across the country, according to the state-run China Daily. China's first population census was conducted in 1953 and counted approximately 594 million people, less than half today's population.